Effortless V8 performance, bulletproof mechanicals and great value make 30-year old Fairlanes increasingly desirable with true-blue collectors. The nature of 'prestige' cars has changed dramatically since Ford's ZA model created a market niche which successive Fairlane models would dominate for almost 30 years. 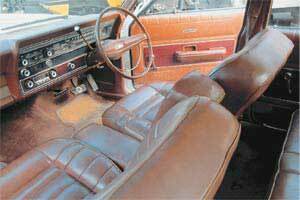 In the late 1960s, carpet in lieu of vinyl floorcovering, a clock, door armrests and (sometimes) power steering were about all that separated 'luxury' Holden, Falcon and Valiant models from basic versions. The air-conditioners, power windows and internally-adjustable door mirrors which we today demand from sub-$20,000 economy models were extra-cost options or simply not available. Holden's EJ Premier started the fad with its inclusion of leather-bound seats, metallic paint and a heater but within two years the cowhide interior had bitten the dust. In that same year (1965) Chrysler upped the ante by offering V8-power as an option on its AP6 Regal, followed down the V8 road in 1966 by Ford's XR Fairmont. However, loyal 'Big Three' customers who wanted a car with extra space and prestige also needed to accept the bulk and expense of a Ford Galaxie, Chevrolet Impala or Dodge Phoenix. Ford Australia was the first to take a different and ultimately more successful stance; adapting a US-designed Fairlane to fill the price gulf between its Fairmont and expansive and expensive Galaxie. Released in 1967, the ZA Fairlane was big, brash, comfortable and - although a six-cylinder engine was available on `Custom' versions - usually powered by a 4.7-litre V8. Self-employed status-seekers, government departments and hire-car operators were among those who snapped up almost 9000 ZAs and 10,770 ZBs in the space of two years. For 1969, Ford boosted the Fairlane's appeal with its release of a wider, slightly longer and definitely more-aggressive ZC version, the options list including a 216kW version of the 5.8-litre '351' V8. While the ZC shared its wheelbase and basic structure with the ZA/ZB cars, vertically-stacked headlamps, a revised grille - inspired by the mid-1960s Ford Galaxie - revised rear quarters and wraparound taillamp clusters emphasised the car's size and presence. Missing, however, was the earlier cars' star-spangled bonnet emblem, replaced by a pedestrian-friendly crest. 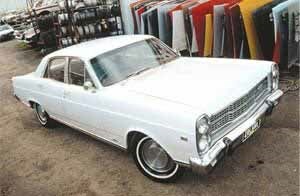 Comfort, value for money and impressive looks were major factors in the Fairlane's success. In basic form, a six-cylinder ZC Custom with three-speed manual transmission, bench front seat, drum brakes all round and cross-ply tyres cost $3330, or only $30 more than a 3.6-litre Fairmont. At $4370 the V8-engined '500' with disc brakes, fully-reclining bucket seats, fake woodgrain dash and distinctive sill mouldings represented the more attractive package. However, no Ford dealer worth his franchise would have allowed a potential Fairlane owner to sign a purchase order without first studying the extensive options list. Even basic items like a radio were optional (just an extra $123), air-conditioning $407 and Australia's first factory-fitted steel sunroof $163 more. ZC sales remained solid but didn't enjoy the surge that Ford executives might have expected; 12,500 ZCs selling between July 1969 and November 1970 when the facelifted ZD arrived. Changes were restricted to a chunky 'egg-crate' grille, some additional body embellishment, new hubcaps and a price increase aimed at moving it further upmarket from the company's Fairmont. Towards the end of the ZD's production life Holden finally delivered a counterpunch in the shape of its HQ Statesman but the big Ford took the threat in its stride. By early 1972 the Fairlane held more than 50 percent of Australia's prestige-vehicle market and would successfully resist the Statesman challenge until the mid-1990s. Michael Gatt has owned our featured Fairlane for a little over six years. During the quest for a "decent" car, Michael - who with brother Daniel operates Gatrek Auto Wreckers in Melbourne - inspected numerous Fairlanes before settling on his highly-original, 351-engined ZD. According to Daniel Gatt, prospective ZC/ZD buyers would be well-advised to follow Michael's example. "Mechanical parts are no problem," he said. "The hard thing is to find a car with a top-class body and good interior because they're the places you'll spend a lot of money if you pick something that's second-rate." Size has everything to do with the on-going appeal of these impressive cars. Although the newest are now more than 30 years old, a well-maintained ZC/ZD offers comfort and performance to rival cars half its age. Personal experience dates back more than a decade but I can clearly recall the ability of a 5.8-litre '351' ZD with T-Bar transmission to comfortably maintain an impressive average speed while transporting four sizeable occupants over unforgiving roads. Like many Fairlanes, this particular car was equipped with non-standard shock absorbers, wider rims and the decadent rumble of dual exhausts. From rest and even with the torque-laden 5.8-litre engine, Fairlanes take more than a few metres to overcome the inertia of almost 1600kg. 0-60km/h takes around four seconds but less than five seconds later you're beyond 100km/h and heading for a standing 400 metre time - according to 'Wheels' magazine's December 1970 road test - of 16.4 seconds. Manual transmission was available throughout the ZC/ZD range and if you happen to find a rare-as 351 four-speed, expect acceleration times about half a second quicker than those achieved by the automatic. In common with all large-format Fords, ZC/ZD Fairlanes suffer from poor steering response. Even with power assistance, 4.5 turns are required to spin the thick plastic-rimmed wheel from lock to lock and manouvring in confined spaces can be tedious. At higher speeds the low-geared steering is masked by the cars' excellent balance and throttle response. Provided you don't plunge deep into a bend then expect the front wheels to counter the inevitable understeer; a ZC/ZD will corner at satisfying pace with minimal wheel movement. On loose or wet surfaces, throttle control is vital as catching that substantial rear end can be tricky. Despite its bulk and archaic suspension design, these Fairlanes handle rough surfaces with ease. No surprise therefore that many of these cars - complete with the obligatory bull-bar - went to rural buyers. The disc/drum braking system fitted to V8-engined cars is adequate for everyday use but those planning to use their ZC/ZD as a towcar should opt for a one that's been converted to four-wheel discs. While the driving position isn't kind to the vertically challenged, broad and well-bolstered bucket seats as found in the majority of ZC/ZDs offer European-style comfort and support. The dash layout with its strip speedo and scattered controls won't be to everyone's liking. 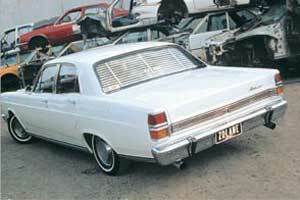 Condition plays a more significant role in ZC/ZD Fairlane values than model or specification. Rust is the big killer of these cars and with good replacement panels in short supply the cost of rejuvenating a seriously rusted car is hard to justify. V8-engined cars needing non-structural repairs, paint and minor mechanical repairs are available for less than $6000 but just $4000 more buys a good-quality 302-engined 500. Although a six-cylinder Custom was substantially cheaper when new than the better-appointed 500, six-cylinder cars in good condition now command similar money due to rarity and lower running costs. At the upper ($15,000-25,000) end of the price scale pickings are slim; top-class 351-engined cars, concours-quality 302s and modifieds the only Fairlanes likely to command five-figure values. Due to demand and scarcity, such cars usually attract long queues of "if you ever want to sell it..." potential owners and few find their way onto the open market. Rust attacks virtually every metal component of a badly-neglected Fairlane and such cars are parts-only propositions. Those which present reasonably well need to be checked for rust beneath body mouldings, in the doors, lower edge of the bootlid, around the rear window and boot floor. Rust-free doors and bonnets cost $250 second hand with unused old-stock door-skins $200 each. Decent bumpers are listed at $195 each, body rubbers $700-850 per set. Mechanical problems with these cars are virtually non-existent. Look for oil leaks around the cylinder heads and from the power steering pump, rusted or leaking welch plugs. Complete replacement engines and parts are freely-available and affordable. Non-standard carburettors fitted to V8-engined cars can cause problems if wrongly jetted or fitted with home-made throttle linkages. If anything is harder to break than a Ford engine, it's a Ford transmission. Six-cylinder and '302' V8 Fairlanes are generally fitted with C4 auto 'boxes which, unless severely abused, will survive indefinitely even though changes might become more abrupt and gears take longer to select as the unit wears. Three or (scarce) four-speed manual transmissions are equally durable. Standard diff or optional limited-slip unit - mandatory with the '351' engine option - will leak oil but are virtually unbreakable. Weighing up to 1600kg, V8-engined Fairlanes have an equally-hefty appetite for shock absorbers and suspension rubbers. Creaks from the front suspension and uneven tyre wear are signs that some of the hard-working suspension bushes have had their day. Leaf rear springs are prone to cracking and in extreme cases the mounting pivots and shackles can fail. Shock absorbers, especially on V8 cars, need regular replacement. Beware the car with an ineffective handbrake - replacement cable sets cost $170. Fairlane electrics generally give little trouble although the standard headlamps aren't wonderful (halogen inserts help) and starter motors traditionally make horrible noises long before they actually fail. A really dodgy starter can be replaced for around $150. Factory air-con came either fully-integrated with extra dash vents or with an under-dash outlet. Neither type worked particularly well when new and are now difficult and expensive to repair.